Suitable for printing, copying and scanning needs, the HP LaserJet M9050 is a reliable multifunction printer. It delivers high quality output, with print and copy resolution as high as 600 x 600 dpi. The HP LaserJet M9050 monochrome printer is made for heavy duty use and can handle 300,000 pages every month. For connectivity, users may choose from the USB or Ethernet port. The HP LaserJet M9050 multifunction laser printer could have been better if Wi-Fi and faxing were standard, though. Users will have no trouble operating the HP LaserJet M9050 as it has an organised control panel with a graphical touchscreen display. The HP M9050 laser printer can handle more than 2,000 sheets and it comes along with an automatic document feeder and duplexer, too. The laser printer is located below the flatbed scanner and the output tray is on the side of the HP LaserJet M9050. The best thing about the HP LaserJet M9050 all-in-one laser printer is its speed of 50 ppm. Print, scan, and copy quality are good. The HP LaserJet M9050 multifunction printer can also send-to email or network folder. To reduce waste and save time, an automatic document feeder and automatic duplexer are available with the LaserJet M9050 MFP. Ethernet makes sharing easy. The HP LaserJet M9050 printer lacks a fax machine and the function of PC-fax. 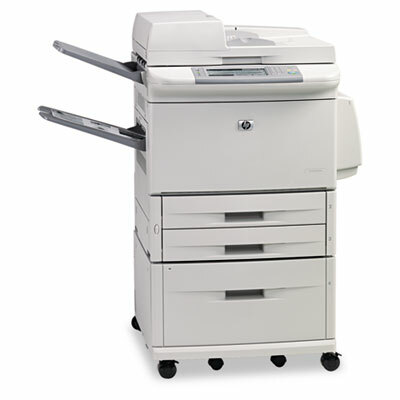 There are multifunction printers that can do the same as the HP M-9050 LaserJet but are less bulky.